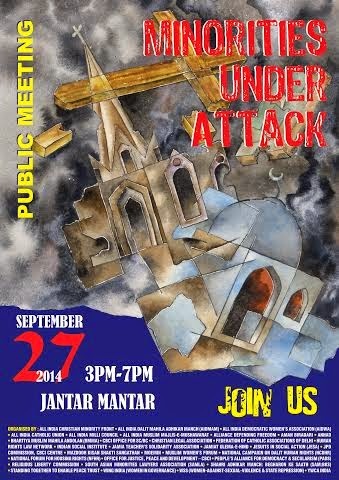 A public meeting, “Minorities under Attack”, has been proposed for September 27 at Jantar Mantar, New Delhi, day on which Prime Minister Narendra Modi will address UN General Assembly. To be held in afternoon, the meeting will see the release of a US NRI sponsored report critical of 100 days of Modi, and those addressing it include Manish Tiwari of the Congress, Ali Anwar of Janata Dal (United), Kunwar Danish of Janata Dal (Secular), CPI’s Amarjeet Kaur, bureaucrat-turned-activist Harsh Mander, ex-Planning Commission member Syeda Hameed, anti-Modi campaigner Shabnam Hashmir, Dalit rights activist Paul Divakar, and Archbishop Anil Jt Couto. Muslim and Christian groups, apart from some human rights NGOs, will support the meeting.